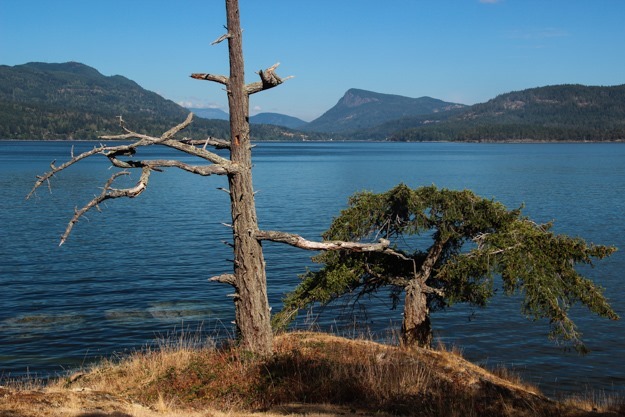 “Windy” isn’t a term usually used to describe the Gulf Islands, but windy is exactly what we’ve had for the last week (July 29 to August 4). Every day we had consistent southeast winds in the 10 to 20 knot range. Although we’re southbound, which means upwind, we’ve been having great sails doing short hops between anchorages each day. One of the other great things about the Gulfs, which I hadn’t really noticed before, is there are a lot of sailboats – more sailboats than powerboats even! Many spots had about 60-70% sailboats, which is in steep contrast to our cruising experience in waters further north (north of Cape Caution), where motorboats were about 90% of the cruising traffic. I think the Gulfs probably have the highest density of sailboats anywhere in the Pacific Northwest. Also, the sailors there actually sail! About 90% of sailboats have at least unfurled their genoa when running downwind in 15 knots (about 10% still motor downwind in 15, which I totally don’t understand), and about 50% sail upwind. It’s been great to see how many Gulf Islands sailors make the effort to sail, and has made our sails more interesting – we get to plan crossings with other sailboats (stand-on versus give-way), and track our progress and tacking angles in comparison to them. On our way southbound in the Strait of Georgia (prior to the Gulfs) we stopped at Hammond Bay after a very slow sail across from Jedediah Island. Hammond Bay is just around the corner from Nanaimo, and is interesting for the tiny island there with some cute shacks that apparently squatters lived in during the Great Depression. Today the shacks have been restored and rented out to tourists. Hammond Bay is exposed to the NW, but we had a forecast of only light SE wind, so it was calm (except for motorboat wake from the nearby launch ramp, and a jet skier). 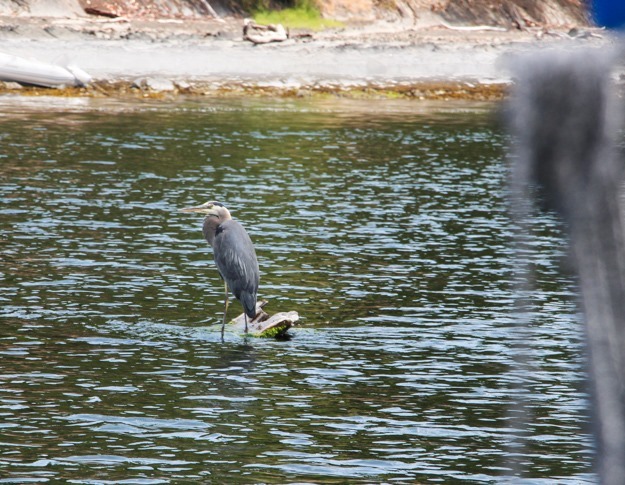 It has a cool lagoon you can explore on the south end – significant current flows into there on the flood, so be aware it can be hard to get back out on a paddleboard! 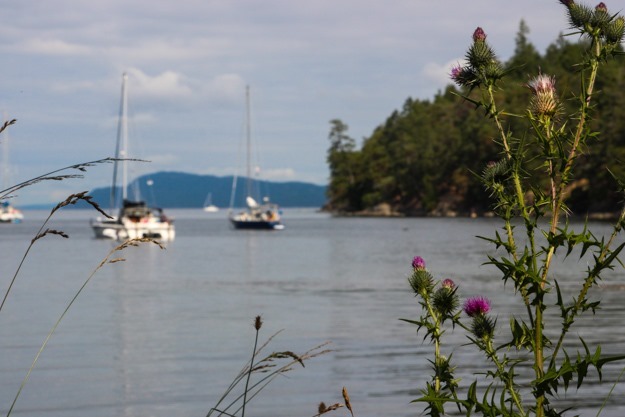 Nanaimo was crazy busy – close to 80 boats in the anchorage, and frequent small passenger ferries zooming through it to Newcastle Island and the Dinghy Dock Pub. All the boat traffic plus 10-15 knots of wind meant the anchorage turned pretty choppy each afternoon. 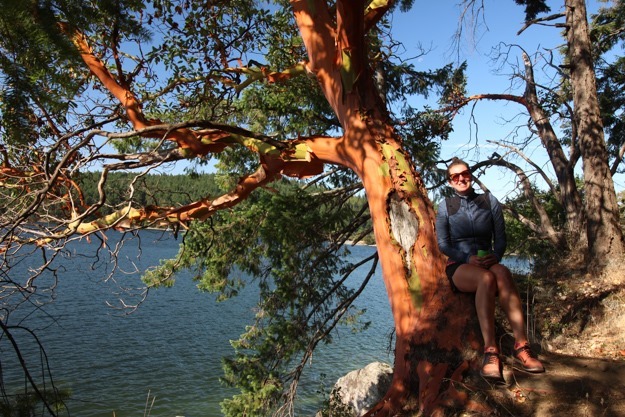 But it quieted down at night, and we got a lot of reprovisioning chores done in our two days here – plus a 2 hour hike around Newcastle Island. An oh so flat Strait of Georgia (that would quickly change in a couple days). Leaving Nanaimo, we had the start of the week of SE winds. We tacked upwind into the channel leading to Dodd Narrows, and then turned on the engine for the 10 minute motor through. Dodd Narrows was crazy town – dozens of boats announcing their position in line on the VHF, and while we were going through a big motorboat decided to overtake us at 10 knots (I guess 6 knots wasn’t fast enough? ), making some big wake in the turbulent current (1 hour prior to slack). 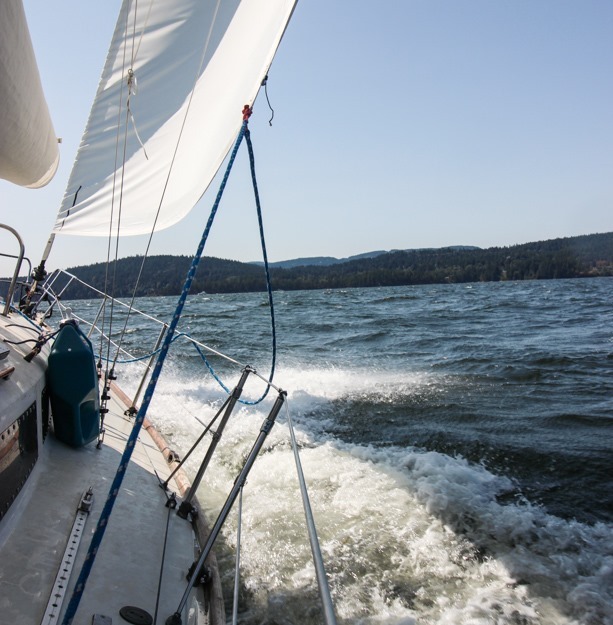 After Dodd Narrows we went back to tacking upwind and hit some pretty choppy waves approaching Danger Reef off the north of Thetis Island, and wind building to 20. We reefed, and of course as soon as we got behind the west side of Thetis Island 10 minutes later it was time to unreef, the wind dropping to 8. We anchored behind Tent Island because the SE wind forecast meant it had pretty good protection (Tent Island is exposed to the NW, so it probably wouldn’t be good then). It was a good anchorage with a nice beach. We passed up Telegraph Harbor because the reviews in our Garmin app said it’s gotten pretty crowded with permanently moored boats filling up the more inner spots. The next day we had a forecast of SE 10-20, and as soon as we got into Houstoun Passage by Wallace Island, we had a solid SE 15-20 against the ebb current. The waves kicked up into 2 foot chop, which is the roughest I’ve ever seen it in the Gulf Islands – usually it’s near lake-like. We reefed and watched the 2 other upwind sailboats fade away behind our stern. Not many boats were sailing upwind (the channel is 0.25 nm wide) but it was much more manageable once reefed, and faster. We anchored north of the Montague Harbor beach because it looked like the southeast gusts were ripping through Montague pretty strongly but less so north of the harbor. A couple days later we heard from a larger sailboat that they got blown off their anchor in Montague. The north beach was a good spot, and after the wind died down in the evening and morning we enjoyed dinghying to the beach and doing the short hike around the peninsula. The next day we had a very short day – 3 nautical miles as the motorboat travels, but 5 miles for us since we were sailing upwind. After about an hour we were anchored in James Bay at the north end of Prevost Island. 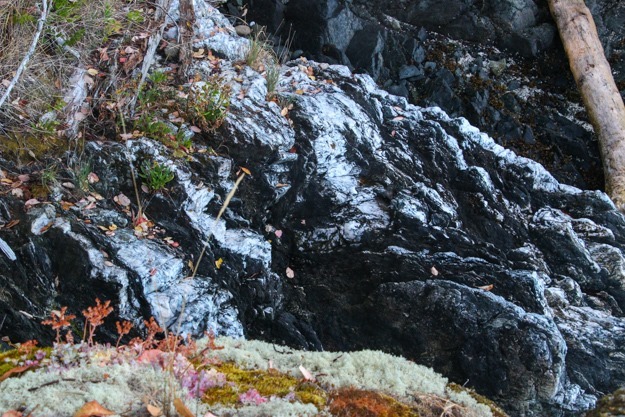 We like Prevost because it has a good hike, and isn’t exposed to the SE wind like Ganges is. We made friends with a sleek 46’ Hanse anchored next to us and got invited over for wine and good conversation. Thanks fellow cruisers! 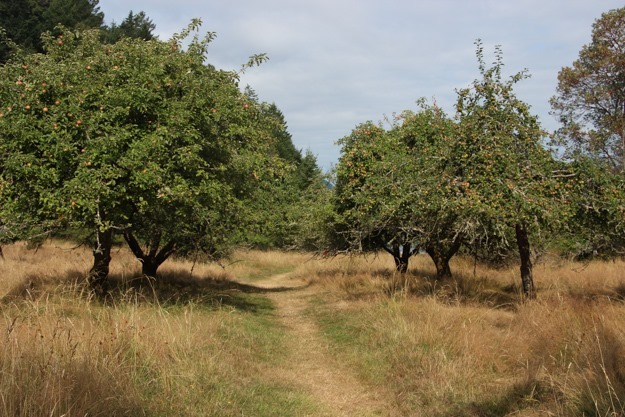 Fruit orchards on Prevost Island – not yet ripe. 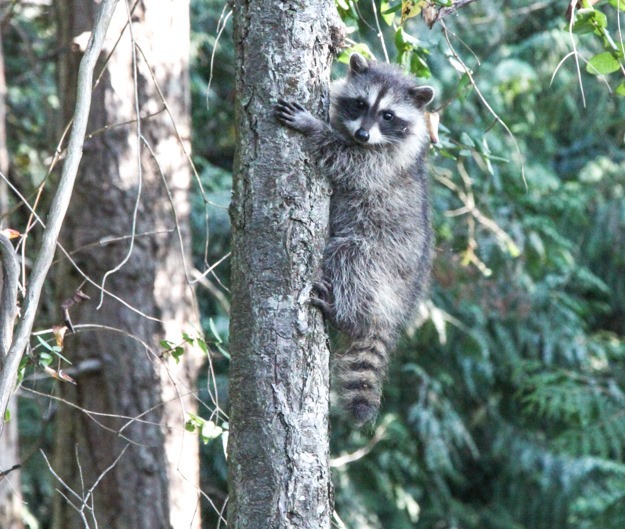 We love Portland Island for the phenomenal perimeter hiking trail, with great water views at every turn. 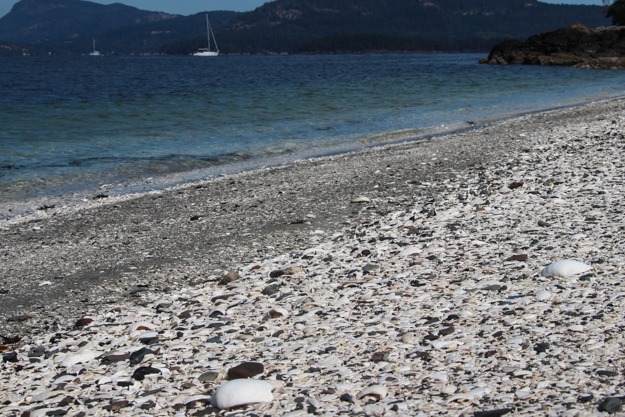 The hike has interesting, diverse terrain – from countless Madrona trees, to a grass prairie, to sand and shell beaches. This time we decided to try an anchorage we had been eyeing for a while. 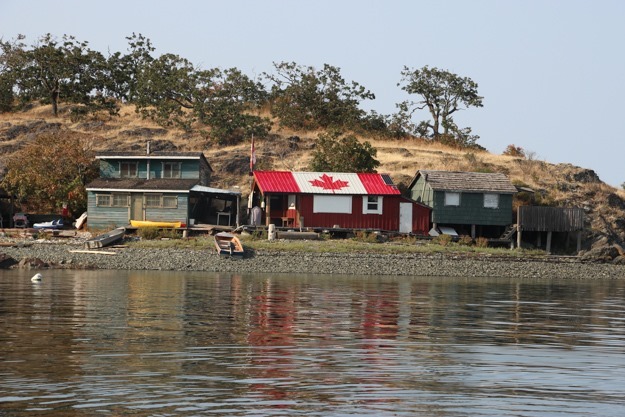 Portland Island has two main anchorages – the stern-tie only Royal Cove at the north end, and the small-ish Princess Bay at the southern end. 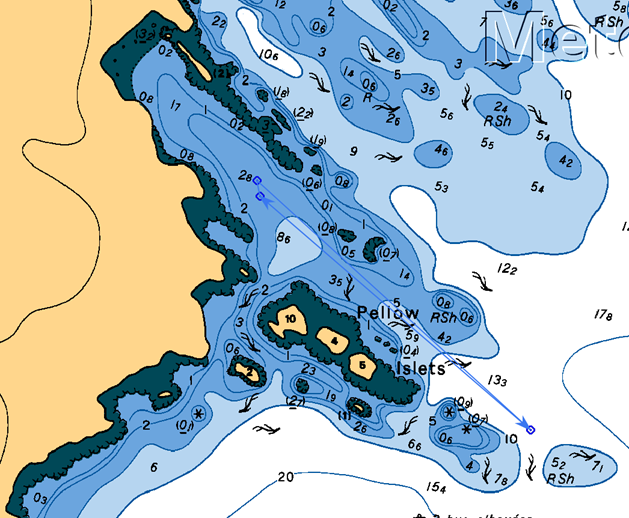 However there’s also a nook on the east, north of the Pellow Islets and southwest of a reef. Blue line drawn to indicate our entry and anchoring location near the 2.8 fathom mark. It gets quite shallow – we went in at low tide till we had 8’ (we have a 5’ draft), then turned around and anchored in 10’ with about 45’ of chain out (15’ depth at high tide). It was a nice, secluded spot but despite the protective reefs it’s still pretty exposed. At high tide, the NE reef is submerged and ferry swell got in to roll us. The SE winds were moderating, but we still had about SE 10 that evening, and wind waves got into the SE opening as well. SE wind in the Gulfs was new to us – conventional wisdom say NW wind is predominant here in the summer, and typically we’ve had to run the spinnaker southbound on flat water or had to motor. 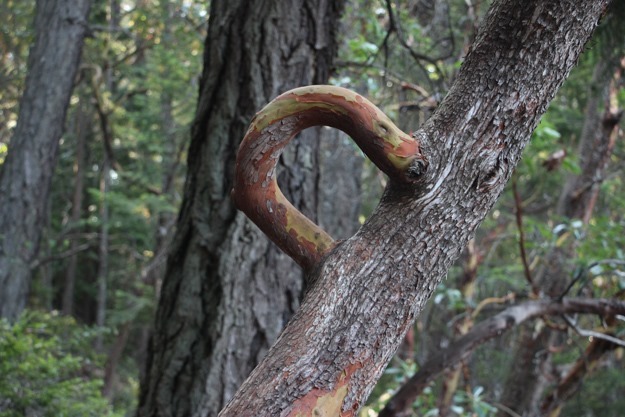 Does anyone with more Gulf Islands experience know if SE winds in the summer are unusual? Perhaps comment below to share your experience. I can only guess that the strong Strait of Juan de Fuca inflow funneled into SE winds (all the way to Nanaimo). What’s also surprising is the SE wind seems just as strong inside the Gulfs as they are out on the Strait of Georgia (going by wind readings on our boat’s wind meter and the BC weather stations (Halibut Bank, Entrance Island, etc)). When the Gulfs had NW wind in past summers, we usually had a 2x wind reduction once inside the Gulfs (ex, 20 kts on Strait of Georgia –> 10 kts once inside). So we always thought the topography here creates strong wind protection – but perhaps this only works for NW winds, and the Gulfs are more open to funneling SE wind. 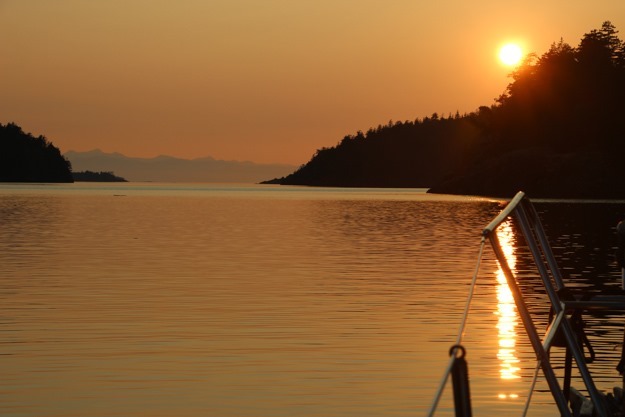 We ended up going through the Gulf Islands using only about 1/2-3/4 gallon of diesel, just what we used anchoring each day, which is pretty awesome for an area where usually we’d have to motor at least 25% of the time. 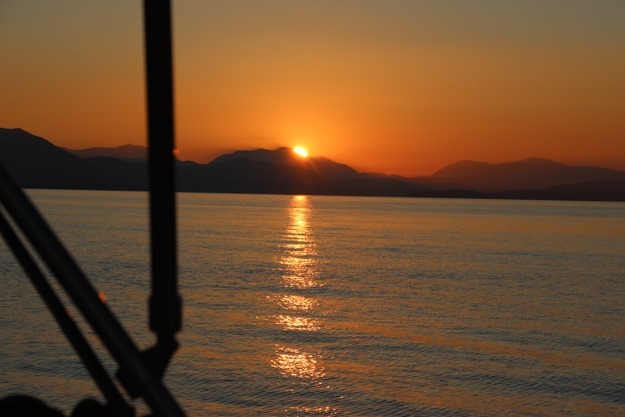 From Portland Island we sailed east across Haro Strait to Stuart Island, re-entering the USA after nearly 4 months in BC. It felt really weird and bittersweet to take down our Canadian courtesy flag! For the rest of August we’re just hanging out in the San Juans, not traveling much since the windless part of August is setting in. This entry was posted in cruises on August 15, 2018 by Patrick. So that’s where all the sailboat are! 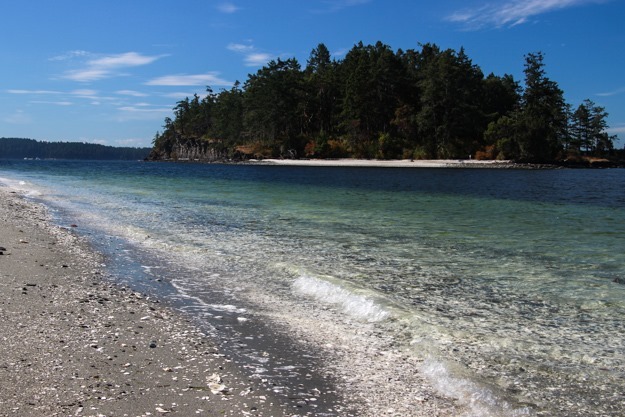 We need to spend more time in the Gulf Islands! Congrats on getting back to Washington. What a trip you’ve had! 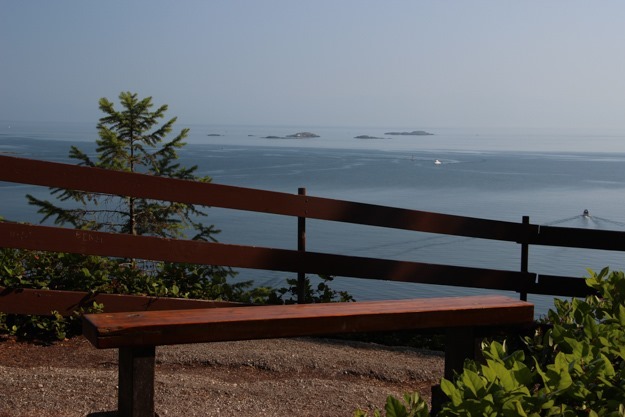 Enjoy the good weather and protection in the San Juans!